Many in cleantech forget that clean energy purchases are part of this major change. OK — No one is online buying a large-scale solar power array at 2 AM with the click of a button. But, we’re here to tell you, cleantech is not completely immune to this new world. There are unique challenges cleantech industries face in adapting to today's new digital buyer landscape. 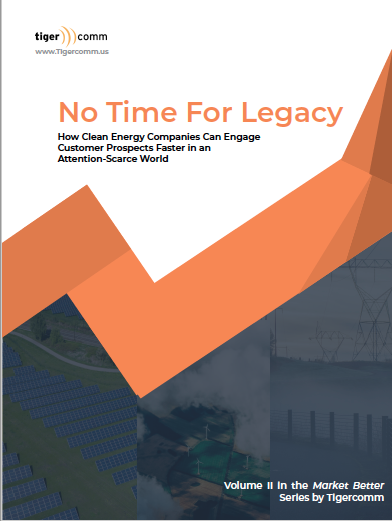 That’s why we’re releasing our first-ever playbook for cleantech marketing and communications – No Time for Legacy: How Clean Energy Companies Can Engage Customer Prospects Faster in an Attention-Scarce World. We’ve dedicated this book to everyone that's charged with building brand awareness and growing their clean energy company’s deal flow with a budget that’s less than they’d like – and probably less than they need. You’re the engine that’s advancing the clean economy. What legacy marketing looks like and how it puts a heavy burden on the sales team. How to link your marcom strategy to the buyer’s journey. The importance of breaking through the clutter online with compelling, value-add content that attracts prospects. How to use inbound marketing practices to help achieve business goals and drive growth. A clear checklist for marketers who want to launch their own marketing communications program following the principles in this book - or simply look for new ideas and tools to improve their existing efforts. Too many companies are using legacy marketing practices that don’t connect to the way buyers are currently making purchases. So, next time you’re sent to a trade show and all you walk away with are some free candy and tchotchkes – consider sharing this book with your colleagues. No Time For Legacy is written by the President of Tigercomm, Mike Casey and the Director of Marketing and Digital, Sarah Lippincott. It is volume II of Tigercomm’s Market Better Series. Get Volume I, Social Wind – here. To learn more about Tigercomm’s inbound marketing services, click here.